Famous for its food centre and car servicing workshops, Alexandra Village in Queenstown is also known for one other thing - traffic congestion. But this might change after a new road, Bukit Merah Lane 4, was opened yesterday. The two-way, 220m stretch, which connects Bukit Merah Lane 2 and Lane 3 to Jalan Bukit Merah, was formerly Malayan Railway land. 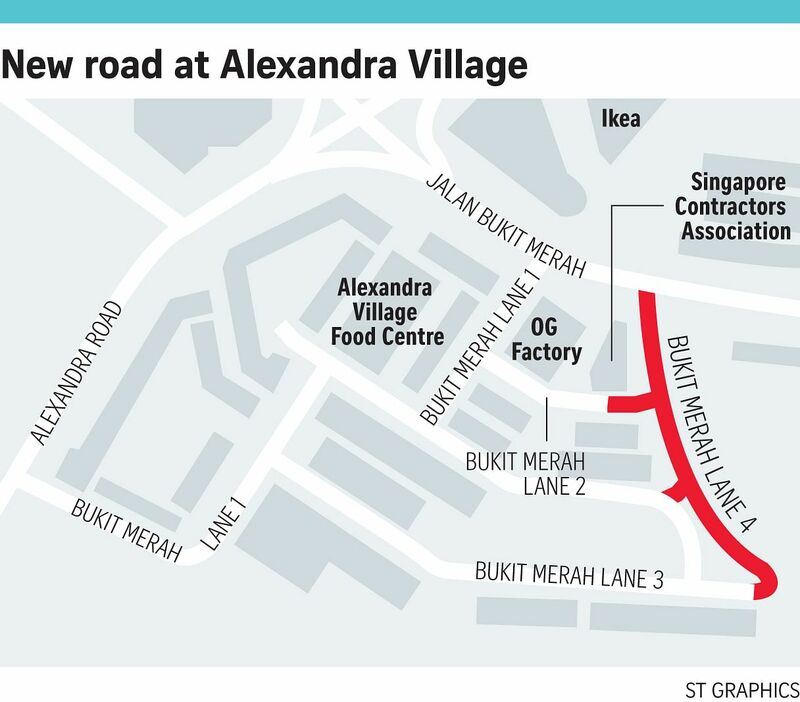 It now provides vehicles another route to Alexandra Village, which was previously accessible only at the junction of Alexandra Road and Bukit Merah Lane 1, or the junction of Jalan Bukit Merah and Bukit Merah Lane 1. Some 265 new parking spaces have also been built beside the new lane, bringing the total spaces there for cars, motorcycles and heavy vehicles to 518. The new road and parking spots are expected to ease the area's traffic congestion, especially during meal times and the weekend. The new road, added parking spaces and their accompanying works, such as drainage, lighting and pavements, cost $1.8 million. MP for Tanjong Pagar GRC Chia Shi-Lu, who officially opened the road yesterday with members of the Alexandra Village Business Association, said the new infrastructure will prove "very helpful" to the area's business owners, customers and residents. Madam Teh Siew Lang, 60, who runs a wholesale shoe shop there, said traffic can get "crazy", especially during weekends. "But business should definitely improve as customers find it more convenient to drive here," said Madam Teh, who is also the vice-chairman of the association. Over at Alexandra Village Food Centre, wonton noodle stall owner B.K. Choy, 63, said the traffic situation has long been a "headache" for customers and stallholders alike. "There is always a very bad jam, and people have no space to park. No parking means no business for us," said Mr Choy. Property investor Jenny Wu, 43, who shops and eats in the vicinity with her family about twice a week, said she will consider going there more often if the traffic situation gets better. But she added: "It seems like only a temporary solution. Once this place expands, parking will not be enough. A multi-storey or underground carpark might be a better idea."